container which is made of mild steel and treated for anti-corrosion, which contain 9 ltrs. of water. The container is pressure tested at a pressure of 350 lbs. Psi (24 bars Approx.). It has an expansion space. b) Gas cartridge (cO2) is stored inside cylinder and coupled to the operating head. It contain 60 gram of CO2 charged with in the container at pressure of 35 bars which when punctured releases the gas and pressurize the water. c) An operating head is secured to the outer container with a plunger and striking knob. The knob is protected by a safety clip or cap to prevent it from accidental operation. There are three vent holes provided on the cap to allow the pressure to release by which explosion hazards of the extinguisher can be avoided. The water type extinguishers are operated (used) for “A” class fire. Carry the extinguisher to the scene of fire, remove the safety clip, make sure the cap is fully screw down and strike the knob hard, direct the water jet in heart of the fire with the wind. c)Wash out the outer container and refill it with fresh water, add antifreezing chemicals if required. d)Take new CO2 cartridge, and after making sure that the plunger is fully withdrawn screw in the CO2 cartridge on the head. The plunger must be fully serviceable. e)Screw down the head fully. f)Write down the recharging date on the body and if rubber hose (discharge hose) is fitted make it fully tight. This extinguisher contains a cap fitted with valve group (normally of brass metal) and a cylinder containing water and space for dry air. The extinguisher is filled with water and air is charged into it at a pressure of 10 bars. This can be charged from a compressed air cylinder or from a compressor. The air can be charged through an adaptor which is fitted permanently to the extinguisher. Test: - a) Monthly weigh the cartridge. foam is a frothy substance entirely consisting of bubbles and these bubbles contain either CO or Air.Mechanical way of producing foam is by self aspiration of a foam solution through a foam making branch pipe by mechanical means and it will produce 72 to 90 ltrs. of foam. These extinguishers are used on “A” & “B” classes of fire. When required take extinguisher to the scene of fire, tight the wheel head assembly, remove the safety clip, hold the discharge hose in the hand and strike the knob hard use the foam directly on fire. a)Unscrew the wheel head and remove the CO2 cartridge. b)Make sure the vent holes are clean. AFFF (Aqueous Film Forming Forces) and dilute it properly. d)Refill the solution is outer container. f)Replace the wheel head assembly and put safety clip on. various types of dry chemical powders were used for many years. But they had various drawbacks. Powder Commonly used for class B&C type fires are usually based on sodium bicarbonate. Potassium bicarbonate powder is also used in many countries. Powder for dealing with carbonaceous (class A) fires as well as class B fires known as General purpose one based on ammonium phosphates. All dry powders are treated to improve their flow and reduce caking. Modern dry powder extinguisher is very efficient. They can use for running fires in highly flammable liquids. Recent developments however have produced powders, which are capable of dealing with carbonaceous fires. The powder extinguishes the fires by stopping chain reactions occurring in the flames. Sodium and Potassium Carbonate are found to be the best. When applied on the flame it smokeless, the fire, draws heat and cools the flame, when it decomposes produce CO2 and water even though it is very little. The importance of the decomposition is that a new cathartically active, surface is formed and that will become as a fire retardant and destroys the radicals that propagate the chain reaction. Ammonium phosphate powder not only extinguishes the class B fire but also class ‘A’ fires. The phosphate content of the general-purpose powder deals with the smoldering by acting in a manner, which is similar to that of a fore retardant. The normally used fire-extinguishing agents are inadequate or dangerous when used on metal fire such as magnesium, aluminum, uranium, titanium, and zirconium metals. A combination of sodium, potassium and barium chloride (ternary eutectic chloride) is used for class “D” fire. The melting point is very low and the capacity for absorbing the latent heat from the metal is very high. The powder melt and forms a fused skin cover the metal, preventing contact with the Oxygen in the atmosphere at the same line absorbing the heat from the metal, so cooling it below its ignition temperature. There are two types of dry chemical powder extinguishers (a) Stored Pressure and (b) CO2 gas pressure type. The construction of the stored pressure type Dry chemical powder extinguisher the outer container is made of mild steel and treated for anti-corrosion cap or head is made of brass fitted with valve group (pressure gauge, charging adaptor etc.) 10 Kg Dry chemical powder and a space for dry air at the pressure of 10 bar/cm2. This can be charged from a compressed air cylinder or from the compressor the air can be charged through an adaptor, which is permanently fitted to the extinguisher. Make sure the container is thoroughly dried, before recharging. conducted only in a clean room using dry receptor. Carbon dioxide has been used for many years to extinguish flammable liquid fires and live electronic equipment fires. Consequently it is widely employed as an extinguishing agent in fixed installation and also in portable extinguishers with capacities ranging from 0.9 kg to 6.8 kg of liquefied gas. CO2 has a number of properties making it useful for extinguishing fire. 1.It is non-combustible and does not react with most substances. 2.It can penetrate and spread it all part of fire area. 3.It provides its own pressure for discharge from extinguisher. 4.It is non-conductor of electricity. and cooling CO2 is relatively nontoxic. will produce about 5 m3 of free gas at atmospheric pressure. Earlier models were operated by striking a plunger at the head of the cylinder. This pierced a sealing disc or by actuating lever device, but in most current models removing a safety pin and then operating the discharge device release the gas. The essential feature about this device, what even its type is that it should open quickly and provide a clear passage for the liquid. If this free passage does not exist, freezing up of the valve occurs. For this reason the small orifices in commercial valves are not suitable. The discharge mechanism is usually designed so that, at an ambient temperature of 15o C to 18o C not less than 95% of the content is released in form of continuous discharge is the minimum time. Owing to the expansion of the discharging gas and its liability to freeze, careful design of the discharge mechanism is essential. A discharge tube is fitted to the cylinder so that liquid CO2 is released through the valve in cylinder head. Expansion may commence in the flexible discharge tube, is fitted, but the greater part of expansion take place in discharge horn. The ratio of expansion is 1:450. The design of the discharge horn is very important feature of CO2 extinguisher’s its main purpose is to stop the containment of air with the CO2 by reducing the velocity of the gas. Without this horn the jet of CO2 gas and air acts like a blowtorch and would increase the intensity of fire. Fire is chain reaction following elements when they meet together eg. Burning material (or fuel),Oxygen(or air) and heat. This fire involving solid material normally of organic nature compounds of carbon in which combustion occurs with the formation of glowing ember. Class “A” fires are the most common and the most effective extinguishing agent in generally water in the form of jet and spray. 2.Those that are not mixable with water petroleum products and edible oils etc. Depending upon a and b the extinguishing agents are water spray, foam, light water, vaporizing liquid CO2 and dry chemical powder. These are fires involving gases or liquid gasses in the form of a liquid spillage or liquid or gas leak and these includes methane, propane, pentane etc. 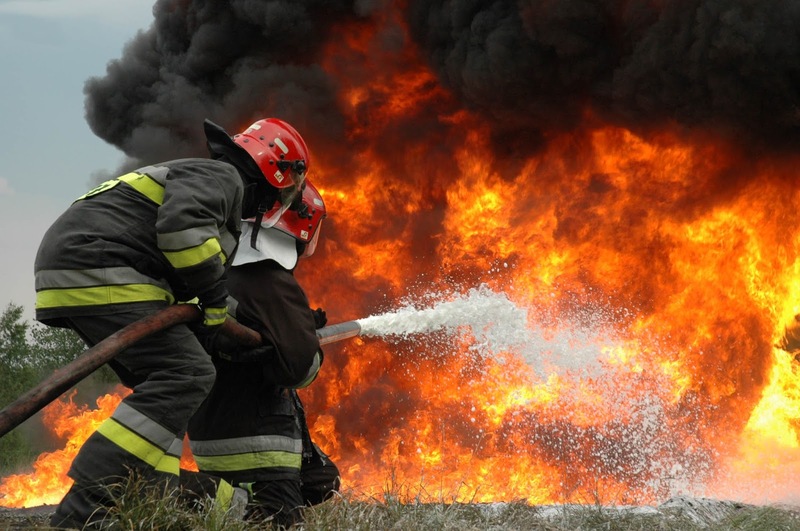 Foam or dry chemical powder can be used to control the fires involving shallow laved liquid spill water in form of spray is used to cool the container. These fire involving metal extinguishing agents containing water are ineffective and even dangerous co2 and carbonate gasses of dry powders m ay also be hazardous. If applied most metal fires, powdered graphite powder talk, soda ash, limestone and dry sand are normally used for class “D” Fires. It is most considered according to present day ideas that electrical fire constitute a class, since any five involving or started by electrical equipment most in fact be a fire of class ‘A B & D’.